Looking for a House Painter in San Mateo, California? But you didn't find just any old house painter. Nick Mejia Painting has been proudly painting homes in San Mateo, California since 1985. Painting the exterior of your San Mateo house protects it from the elements, helps retain home value, and makes it presentable. Interior painting can brighten walls and ceilings and lift one's spirits. When looking for affordable high quality house painting San Mateo home owners can count on, no one beats Nick Mejia Painting's experienced painters. 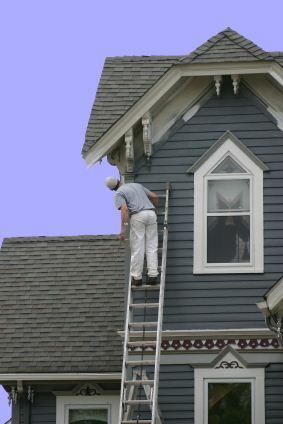 If you have ever tried painting your San Mateo home, you know that its not an easy task. Painting houses is both a skill and an art. That's why Nick Mejia Painting's professional house painters must have several years of experience painting houses in and around San Mateo, California and be familiar with San Mateo's various residential architectural styles and building materials used in house construction over the years. 5★★★★★ - "Not only does he do a top quality job for a very reasonable price, he's patient and thoughtful in managing decorating neurosis, and his instincts are spot-on. ""I've left the guy and his crew to work and come home to a perfect paint job and no other sign that anyone was in the house. And I've been home while the work was being done and enjoyed good conversation and laughter. "If you're looking for a painter, look no further than they and associate!" 5★★★★★ - "I have used this company exclusively to paint the interior and exterior of my home for over 10 years.I can always count on them and his reliable crew to use the finest materials and to produce outstanding results. His work lasts year after year. I have heard horror stories about other painters and have seen their inferior results. When family and friends need a reliable painter, I have only one recommendation: Use this company for a top quality job." 5★★★★★ - "I have used this company exclusively to paint the interior and exterior of my home for over 10 years. I can always count on them and his reliable crew to use the finest materials and to produce outstanding results. His work lasts year after year. I have heard horror stories about other painters and have seen their inferior results. When family and friends need a reliable painter, I have only one recommendation: Use this company for a top quality job." 5★★★★★ - "Nick Mejia Painting has been in business forever. There are reasons for that. He treats every home and business he works in as if it were his own. No careless paint splatter and crud left behind when he's done. Mr. Mejia's attention to detail is almost pathological. The bottom line though, is that he provides a great service for a fair price, and what more could you ask for?" 5★★★★★ - "This company painted our house in San Francisco. They did a great job. I highly recommend them. They will come out and give you a quote and start the work right away." 5★★★★★ - "Nick Mejia Painting just finished painting the exterior of my house. John made the entire experience very smooth and trouble-free. The preliminary work-scraping, priming, stucco patching, etc.-was very expertly done, and everything was completed in a timely manner. There were some complications due to a new roof and some woodwork repairs being done during the same time period, but once that was completed, the guy quickly sent over his men to take care of all the touching up and additional repainting necessary. I would definitely recommend his services to anyone with painting needs." 5★★★★★ - "First rate Excellent service. On time, reliable, honest & friendly. Very happy with the work they did." 5★★★★★ - "You were on time, professional and completed the work under the time you estimated. Always a good thing when that can happen. I will be sure to tell neighbors about your good work. And we will definitely give you a call for any future work." 5★★★★★ - "There were some complications due to a new roof and some woodwork repairs being done during the same time period, but once that was completed, The guy quickly sent over his men to take care of all the touching up and additional repainting necessary. I would definitely recommend his services to anyone with painting needs." 5★★★★★ - "His work lasts year after year. I have heard horror stories about other painters and have seen their inferior results. When family and friends need a reliable painter, I have only one recommendation: Use this company for a top quality job." 5★★★★★ - "Thanks once again. The guy was very happy that all things having to do with his TV were working! Yeah! And we are both very pleased with the work you and your team did. You were on time, professional and completed the work under the time you estimated. Always a good thing when that can happen. I will be sure to tell neighbors about your good work. And we will definitely give you a call for any future work." 5★★★★★ - "Painting just finished painting the exterior of my house. John made the entire experience very smooth and trouble-free. The preliminary work-scraping, priming, stucco patching, etc.-was very expertly done, and everything was completed in a timely manner. There were some complications due to a new roof and some woodwork repairs being done during the same time period, but once that was completed, The guy quickly sent over his men to take care of all the touching up and additional repainting necessary. I would definitely recommend his services to anyone with painting needs." 5★★★★★ - "The guy has painted my entire house, in stages, starting from my first nervous forays into painting (do I need to choose a white for the ceiling?") to my bolder decisions ("Yes, it's really what I want. (Pause) Why, do you think it'll look bad?") Not only does he do a top quality job for a very reasonable price, he's patient and thoughtful in managing decorating neurosis, and his instincts are spot-on. ""I've left the guy and his crew to work and come home to a perfect paint job and no other sign that anyone was in the house. And I've been home while the work was being done and enjoyed good conversation and laughter. "If you're looking for a painter, look no further than they and associate!"